In a whirlwind tour, the nation's housing and urban development secretary secretary sees federal programs in action. LEWISTON — A Lewiston couple took Maine’s senior senator and a member of President Trump’s Cabinet on a tour of their home Friday and thanked them for supporting programs that provided funding to help remove lead paint from old homes. Robert and Christina Edwards, and their 5-year-old daughter Future, showed Sen. Susan Collins and Housing and Urban Development Secretary Ben Carson the 1923 home they’d purchased a year and a half ago, and said the programs had helped them, particularly with removing peeling lead paint from the back porch. “The programs made a big difference for us,” Christina Edwards said. Carson said the lead paint program has been a priority for him – and as a result its funding has gone up to $240 million this year. Next year, President Trump has proposed hiking it to $290 million nationwide. But although the city has been getting enough federal money to clean up 225 housing units annually, Lewiston’s director of economic and community development, Lincoln Jeffers, said it’s not enough. He said it will take about 80 years to deal with all the lead in downtown housing at the current rate. Rep. Jared Golden, D-2nd District, said Friday that HUD ought to work with Congress to increase the budget for lead removal funding to $2.5 billion annually for the next five years. Insisting “the status quo just isn’t acceptable,” the congressman urged Carson to require lead removal from all homes owned by the federal government or financed with government mortgages, set common-sense standards for states receiving lead prevention funding and increase funding sharply. Collins said that from her seat on a key appropriations subcommittee, she will make sure that the increase sought by the president for lead abatement is approved. Lead paint is an issue mostly critical in the Northeast, where many homes were built before the 1978 ban on lead paint. The Edwards’ home was one of four places Carson visited in Lewiston and Auburn on Friday. Along with Collins, Carson also toured the Tree Street Youth Center and New Beginnings, nonprofits that work with local youths, and met with Auburn Mayor Jason Levesque to talk about opportunity zones, an economic development tool. Carson’s proposed HUD budget would wipe out the $3.4 billion Community Development Block Grants program, a tool for cities such as Auburn and Lewiston to address local issues. It’s also a key source of funding for a major expansion at Tree Street that Carson toured. An earlier effort by the president to end the block grant program got nowhere when a Republican-controlled Congress refused to go along with it. With Democrats at the helm in the House, Trump’s proposal has even less chance of approval. At Tree Street, Carson expressed joy at much of the artwork created by young people and praised the efforts of its staff and volunteers to help create bright futures for children in the struggling neighborhood. 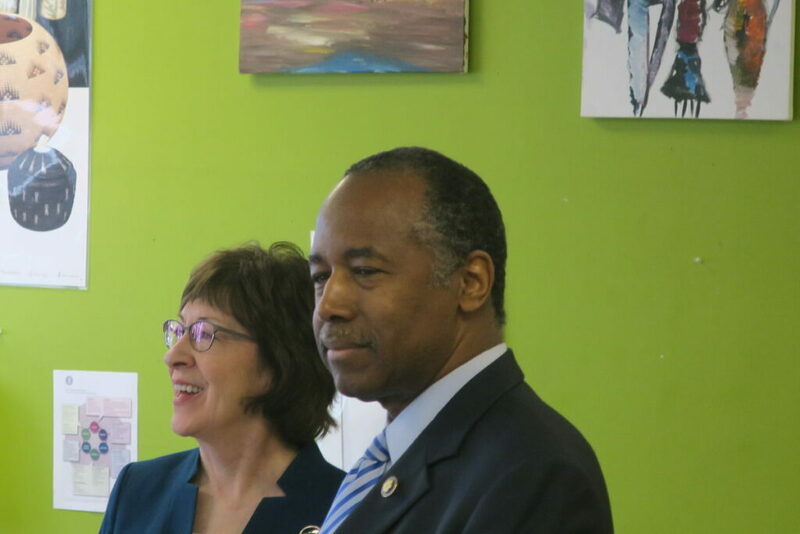 Collins said she was “very grateful” that Carson made the time to come to Maine and see for himself how HUD programs boosted people. “Both of us have learned a great deal,” she said.